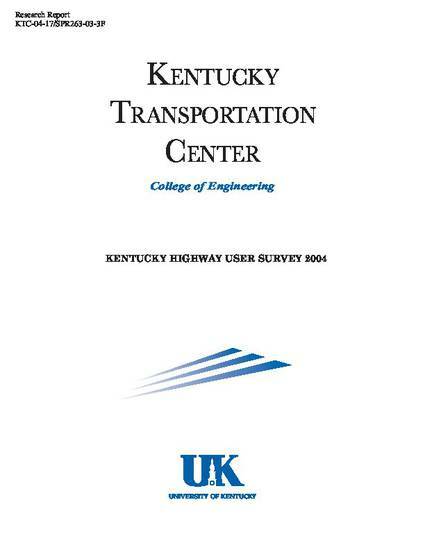 The purpose of this study was to continue the efforts begun in 1997 to monitor Kentucky public opinion regarding the quality of highway systems, including a portion to measure satisfaction with current drivers’ license and registration renewal processes. Kentucky’s 2004 public opinion is compared to data colleted in previous years to gauge the state’s progress. The contents of this report reflect the views of the authors, who are responsible for the facts and accuracy of the data presented herein. The contents do not necessarily reflect the official views or policies of the University of Kentucky, the Kentucky Transportation Cabinet, nor the Federal Highway Administration. This report does not constitute a standard, specification, or regulation. The inclusion of manufacturer names or trade names is for identification purposes only and is not to be considered an endorsements.